The Patriots got shoved into a trash compactor last night, and watching it felt wonderful. 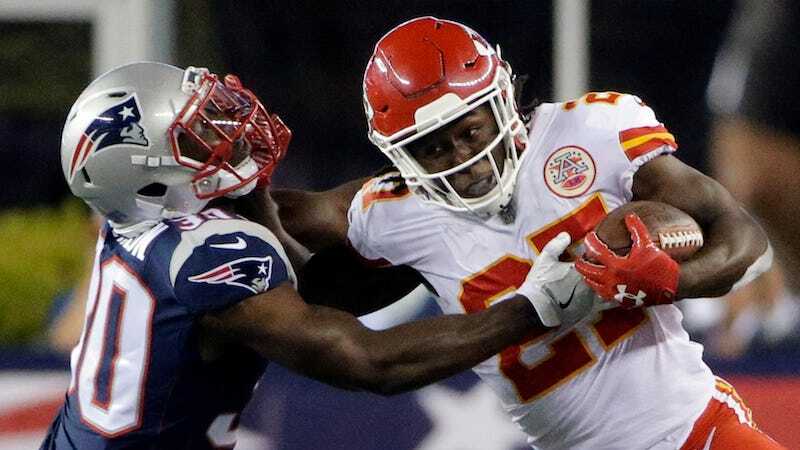 Alex Smith’s passable and shocking Aaron Rodgers impression may have been the most impressive part of the Chiefs’ performance, but the part that was the most fun to watch was rookie running back Kareem Hunt making his splash. If there was one fun fact to share about Hunt before the start of this game, it was this: In four seasons at Toledo, where Hunt got 855 total touches, he only ever fumbled the ball once, and he recovered it himself. So what did he do on his very first NFL carry? He fumbled the damn ball and the Patriots recovered. At that point, a typically depressing NFL storyline seemed to be taking shape: Rookie fumbles on first career carry. Gets benched. Cries on camera. Hunt was drafted in the third round this year, and maybe you wouldn’t be blamed for taking little notice of a guy who made the first-team All-MAC in 2014 and 2016. He had a fantastic career at Toledo, but college football is lousy with running backs who break records at small-conference schools and then are rarely heard from in the pros. They are usually 5-foot-6. Hunt was always a great runner at Toledo, he finished his college career with 4,953 yards and 6.3 yards per carry, but it wasn’t until his last season that he showed his ability as a receiver. After catching 32 balls in his first three seasons combined, Hunt caught 41 passes for 403 yards in his senior year. If there’s any reason to believe that Hunt’s debut portends good things for the future, it’s that receiving ability. The feature back is basically dead at this point, but the best way to stay on the field long enough to have a shot at becoming one is to be just as dangerous catching the ball as you are running it. Maybe I’m just nostalgic for the days when the NFL was ruled by guys like LaDainian Tomlinson and Priest Holmes; maybe I’m just panicking about how bad the NFL has been at finding and cultivating young stars lately, but I would love to see Hunt become a star running back. The NFL needs all the interesting and enjoyable players it can get right now—as fun as last night’s game was, injuries to Eric Berry, Danny Amendola, and Dont’a Hightower were a grim reminder of just how tenuous stardom can be—and Hunt, for one night at least, fit the bill.